Do you know the instruction ‘Relax your jaw’ or ‘Separate the tongue from the palate’ or ‘Relax your inner ears’? Have you ever felt what it does to your physical and mental state when you can ‘broaden your tongue , feeling the palate broadening towards the inner ears’. I find it very interesting, when students can let go and experience a deeper relaxation with such instructions. 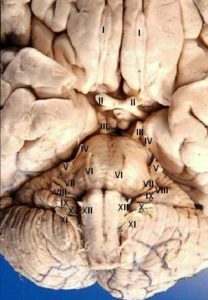 Cranial nerves emerge directly from the brain. Most of them originate in the brainstem. When we practice final relaxation (savasana), we bring awareness to certain areas in our body and then we let go of them. When relaxing our facial muscles, we address the cranial nerves directly and they respond by calming and quieting. They are responsible for controlling nerves in the face, for movements of the eyes and vision, for smell and for taste of the tongue (note:have more functions). Below I would like to share with you instructions that work really well. They tremendously help to let go of physical and mental tensions. Cranial nerves relay information between the brain and parts of the body, primarily the head and neck.